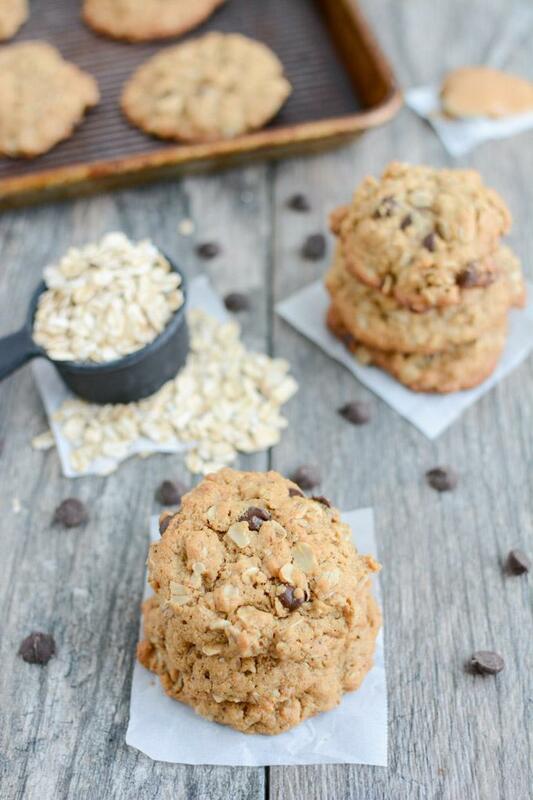 These Dairy-Free Lactation Cookies are the perfect snack for nursing moms. Not breastfeeding? 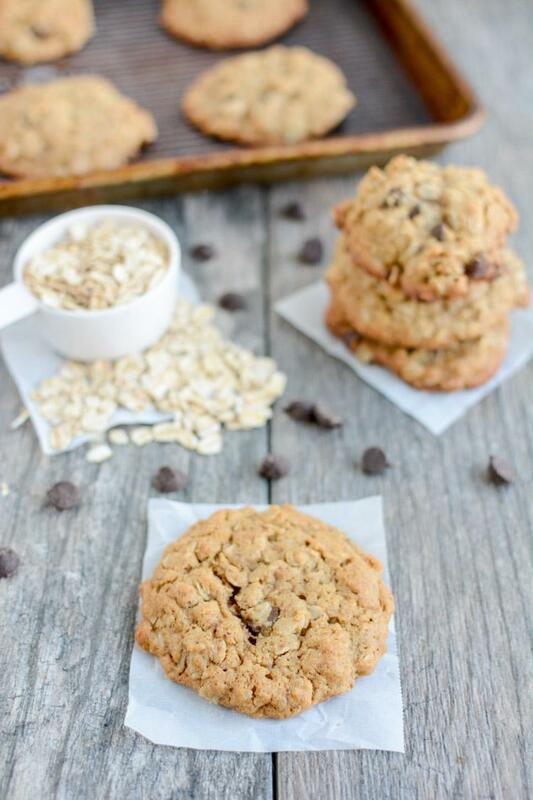 Leave out the brewers yeast and enjoy an oatmeal chocolate chip cookie for dessert! Just popping in to make your Monday a little better with some cookies! I’ve been lucky enough to have a pretty steady milk supply for the past 3 months while nursing Little Miss….but I did have one weekend where I woke up and felt like maybe it had dropped a bit. After a brief panic, I decided it was the perfect time to try my hand at making some lactation cookies. I ordered some brewers yeast while I was still pregnant just to have on hand and several months later, it was still sitting untouched in the pantry. This is the kind I ordered (aff link). While it’s not guaranteed or scientifically proven to work for everyone, many nursing moms have had success with using it over the years and I figured it was worth trying out. I’ve made these cookies 3 times now. They’re perfect to have on hand for a quick snack or after dinner treat. They also freeze well so sometimes I make half the batch and then scoop the rest into balls on a tray, freeze them and then transfer to a ziploc bag so I can just pull out a few at a time and bake them. If you have a friend who just had baby, these would be perfect to take with you when you go visit the new little one. Even if they don’t boost her supply, they still taste great! 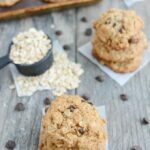 And if you’re not a nursing mama and are simply looking for a good dairy-free chocolate chip cookie, just leave out the brewers yeast, add an extra tablespoon of flax and enjoy! Combine coconut oil and peanut butter in a large microwave-safe bowl. Microwave 60 seconds or until coconut oil is melted. Stir well to combine. Add brown sugar, eggs, vanilla and cinnamon and mix well. Scoop onto greased or lined cookie sheets and bake at 350 for 12 minutes. If you don’t need them to be lactation cookies, leave out brewers yeast and add an extra Tbsp of flax. Pretty simple right? And don’t worry….if you’re not a breastfeeding mama, you can still eat these if they’re made with brewers yeast. They’re not going to make you start producing milk or anything! And if you’re wondering if they worked for me, I would say yes. They certainly didn’t start making me produce gallons of extra milk or anything, but after eating them for a couple of days and drinking a lot of water, I felt like my supply had returned to normal. Awesome! Just ordered brewers yeast yesterday and was going to look for a recipe – will make soon! However 2/4 flour? Is that a typo? or did you mean 1/2 cup – or 3/4 cup? Thx! oops! 3/4 cup. just fixed! These look great! I was just rummaging through the sale bin at Sprouts and they had a bunch of lactation cookies on sale. I’m a sucker for a sale so I checked out the ingredients to see if I could eat them without needing to lactate ha ha but they had so much JUNK in them! So much better to make them homemade! I never have trouble with milk production….it’s already happening and I’m 30 weeks pregnant lol! BUT if something goes awry this time around you better believe my first step in trying to increase production will be to make these cookies! These look so yummy! I have a lactation cookie recipe but I think I went a little too overboard making it healthy…it’s okay for nursing mamas to indulge a bit and these look like they would really hit the spot. I also love that it’s dairy-free! So many nursing moms need to cut out dairy because their babies have a reaction to it. Thanks! they’re a new fav for sure! These look really great. I’m producing what I need for my son, but I decided to try to donate milk to my hospital’s milk bank. I’ve been trying to boost my supply a bit so I’m able to slowly build up a donation stash. My son has a mild dairy intolerance, which makes indulging after a long day difficult. Looks like these will help with both. I’m not lactating but I love a good dairy-free cookie! I’m also an egg-free person haha I might try to make them with flax egg replacers for extra flax! Gotta get those good omega’s in! Hello. I was wondering how you know when the cookies are done by looking at them. Also, are you supposed to put them on the tray rounded or should they be flattened out before baking? You can do either. If you a prefer a flatter cookie you can definitely flatten them out a little bit before baking. I usually touch them lightly. If they seem sturdy they’re probably done. If it totally collapses where you touch, give them a couple more minutes. These look great! Can’t wait to try them. Just wondering how they would go freezing? I’m looking at doing a big batch of them up before bubs arrives in mid May. Do you have any storage ideas? I usually have good luck freezing cookies but I’ve never tried ones with coconut oil. I think they would work. I usually just use a cookie scoop to put them on a plate, stick that in the freezer until they freeze and then transfer them to a ziploc bag. then just pull them out and bake. How many should you eat a day to get results? And, are you eating them every day? My husband made them and they’re so good, so I wouldn’t be mad if you told me I had to eat a bunch, but I also don’t want to go crazy on the sweets. I usually just eat one a day. Sometimes two.